Wilburn Medical USA has proudly distributed syringe pumps in several markets including, but certainly not limited to anesthesia, nuclear cardiology, and veterinary medicine. No matter your infusion application, Wilburn Medical USA has the syringe pump that will suit your needs. Not only do we proudly distribute Baxter, Bard, Smiths Medical/Medfusion, and the Graseby, but we also are excited to feature our Aitecs line of syringe pumps, which are so versatile they can be integrated easily into any lab or office! We have included several customer testimonials that there may be no doubt of the efficacy, efficiency, and usability of the Aitecs line of syringe pumps. The Aitecs line includes basic 10 S Plus our ml/hour device for the simplest infusions through our 12 S AUTO that features custom protocol programming, the ability to increase or decrease the infusion rates as a part of the protocol, and the ability to deliver medication in mass units (ug-mg/kg/min-hr). The 12 S AUTO is the only FDA approved pump with this capability. The Aitecs line of syringe pumps also includes the 21 S Dual Channel syringe pump. The 21 S has two separate and independent infusion channels making it “2 pumps in one”. The 21 S is available in the standard and AUTO configurations and is incredibly useful where space is limited. All pumps are provided with a one year parts and labor warranty and extended warranty contracts are available. No matter what your application, Wilburn Medical USA has the syringe pump you need, at a price you just won't believe! Cholecystokinan (Kinevac).and a host of other drugs. The 3400 pump has wide appeal in the Nuclear Medicine/Nuclear Cardiology areas because of its wide range of features. It can infuse virtually any IV drug with a range from 0.1-1200ml/hr. It has multiple unit selection, syringe size flexibility, simple operation, is AC or battery operated and has an accuracy of +/-2%. This pump is currently being used in thousands of Nuclear Cardiology and Nuclear Medicine Departments throughout the United States. 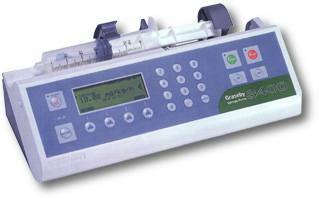 The Graseby 3400 has an open communications protocol to allow the pump to be remotely controlled and / or monitored. This makes it ideal for use with pharmacokinetic model driven systems or by other types of equipment requiring controlled drug delivery. New and refurbished models are available. The Medfusion 3500 Syringe Pump is an intuitive system designed to enhance safety while maintaining simplicity. For more than 15 years, the Medfusion Syringe platform has been the technology leader in syringe pumps with its innovations in syringe recognition, drug libraries and dose limits. Support for up to 16 different care areas allows for transport of the Medfusion Syringe Pump into any department within the facility. As measured by the ISMP and other regulatory qualifications, the Medfusion Syringe Pump is truly a “smart” pump. Designed with both adult and pediatric facilities in mind, the small, lightweight SPACE System allows for flexibility and easy transport within a number of care settings. At 9 inches by 6 inches and weighing only three pounds, the SPACE pumps can fit easily into a range of environments. The system is designed for higher acuity care facilities, offering a large drug library as well as the capability to build up to 24 pumps in a single bedside tower. Anesthesiologists also benefit from the compact size of the Perfusor® SPACE syringe pump in crowded operating room environments, where three pumps easily interlock on a pole clamp.